Recently I was given the opportunity to preview an upcoming new game that will be coming soon to Kickstarter. I received a preview copy of the game and rules. These are my thoughts and opinions on the presented materials. Enjoy! Flaming Pyramids is a game by Norbert Abel, published by Cheeky Parrot Games. It is for 2-6 players. In this game, players will be trying to use all of their building materials to build a great monument to the Pharaoh. They will need to make sure that their calculations are correct or the monument will fall. If that wasn’t bad enough, they’ll also have to make sure that fires don’t break out either as this too can cause a collapse. In the end, the architect that can best rid themselves of their building materials first, will be declared the winner. For this review, I will mainly be discussing the introductory game. There are variations to the rules that make the game more family oriented and some that make it more competitive. For more information on these, please check out the rulebook. To begin, the cards are shuffled together. They are then dealt out evenly among the players. Each player will place their cards into a facedown pile in front of them, drawing a hand of 5 from the stack. Any leftover cards that were not able to be dealt out are placed in a face up row in the middle of the play area. If any of these face up cards are Ember cards, then they are removed from the round. 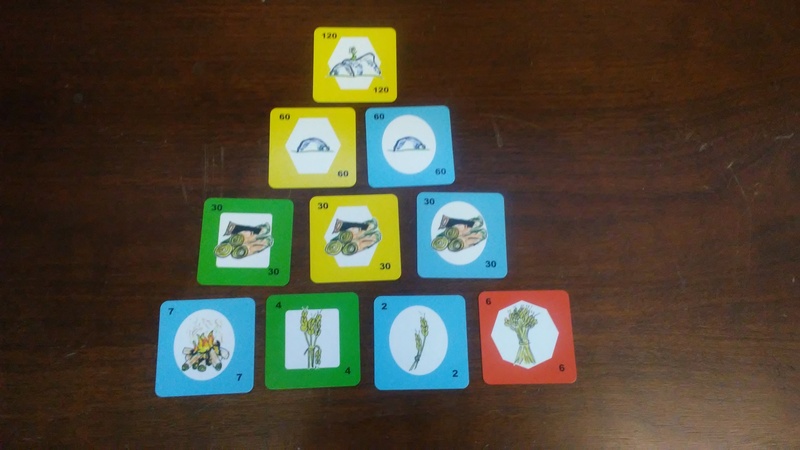 An Ember card shows a fire and is present on the 1 yellow, 1 green, 7 blue and 7 red cards. The first player is chosen and play now begins. The game is played over a series of rounds. Each round players will take a turn consisting of playing a card onto the pyramid, resolving any mayhem that may occur from the placement and then drawing back up to their hand size of 5 cards from their draw pile. On a player’s turn, they will choose a card from their hand to place onto the pyramid in the middle of the play area. When placing a card, it will need to be placed so as to form a pyramid shape. If there are no cards, the card is simply placed on the table. If there is only 1 card, then the card played may be placed on either side of the previously placed card. If there are 2 cards next to each other with no card on top of them, then the played card must be placed on top of them. If there is a complete pyramid shape, then the played card must be placed on either side of the base. In some cases there may be some open spaces on top of or between cards due to mayhem. In these cases the player is free to choose which of these free spaces to use. Mayhem can occur when a card placed on top of another does not match one of the two cards beneath it in color or number. It can also occur if the card’s weight is higher than the sum of the two cards beneath it. Each card has a number on it that indicates the weight of the card. This number is used to determine when mayhem occurs in this regard. As long as the card does not cause any mayhem, nothing happens. If the weights or colors were wrong, then a collapse occurs. When a collapse happens, the two cards beneath the mayhem inducing card are removed from the pyramid and placed on the bottom of the player’s draw pile. The card that was placed will then move down and over to either the right or left, player’s choice. The player must then check to make sure no more mayhem or collapses happen. Once all of the cards fit properly, play can continue with the player drawing up to their hand size of 5 cards. Play then passes to the next player in turn order. The game continues until a player has played and placed all of their cards. Once a player has rid themself of all of their cards, that player is crowned the winner. A new game will then begin following the same setup rules and starting with the person to the left of the last round’s starting player as the first player. A full game concludes once every player has been the starting player one time. Simply put, this game comes with a single small deck of cards. The cards are all small and square. Of course this is a prototype so that may change later. The artwork may also change. As it is now, each one looks like a child’s rendition of things like rocks and logs and fire. Not that there’s anything wrong with that. The simplistic design kind of works. That said, I’m sure most players will more than likely hope for a better overall look. The cards themselves are pretty good quality, even for a prototype. They seem to be quite durable with a good finish to them. Here’s hoping this stays that way. In any event, I think that thematically the idea works. You get a good sense of what you’re trying to accomplish along with a good weight ratio, such as large rocks being heavier than logs which are heavier than straw. I really think that this game is headed in the right direction and I look forward to seeing just how the game will look officially. Just like the cards, the rulebook was also a prototype. That said, the book itself looked pretty close to production quality. Granted it was on copy paper folded together, it still looked pretty good. There were lots of great looking pictures and examples in full color on practically every page. The book was simple to read and easy to understand. There were even rules for playing it as a family game or as a competitive game, along with several strategic tips. Needlees to say, I was pretty impressed by this initial design. I expect that the final rulebook will be even better. The book wasn’t that thick either so there wasn’t a lot to read either. Overall, I think the rulebook is definitely headed in the right direction. I have to say, this is a pretty fun little tile laying game. It does involve a bit of math skills and might not be great for those that are color blind, but in general it’s not bad. The idea is simple. Try to be the first person to get rid of all of your cards by placing them in an ever growing and changing pyramid. You’ll want to use those fires early on so that hopefully you don’t wind up with this massive collapse that’ll throw a bunch of cards back into your stack later on. Needless to say, the game can get quite strategic, especially with just 2 players. For this reason, I especially like it as a 2 player game. Three and four players is still good but 2 is best for me. Haven’t tried it with more than 4 so I can’t comment on anything more than that. Regardless of how it’s played, the game moves quite smoothly and quickly. It’s a good family game that most everyone can play. As I noted above, the math skills might mean that the little ones need a bit of help playing this one. I think fans of tile laying games like Carcassonne or simple card games like Hoard, should enjoy this one. Overall it’s simple, fast and fun. A great combination of fun and strategy. I’d recommend giving it a try. 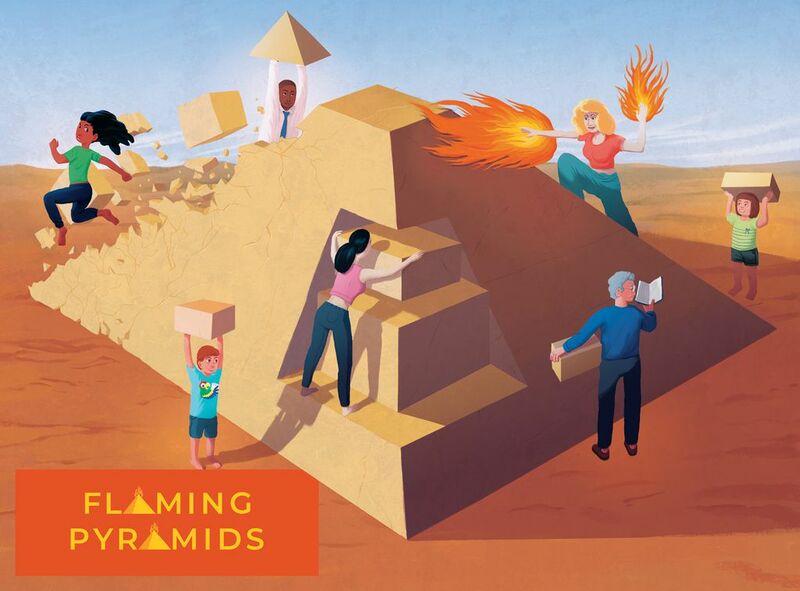 Flaming Pyramids is a tile laying game of pyramid building. The game is fairly quick and simple. Most game sessions last around 15 minutes. The look and feel of the game is fairly simplistic and easy to understand. Of course, this is a simple prototype so I expect to see much better graphics when the game is completed. It’s fairly straight forward and family friendly, although younger players may need some help with the math elements of the game. There’s some good player interaction and quite a bit of strategy involved, especially in the lower player counts. I really enjoy the game the most with 2 players. Fans of tile laying games like Carcassonne should enjoy this one. I’d also think fans of simple card games like Hoard should enjoy this one too. This is a game that I’d recommend trying out. I think it will appeal to a lot of different players. Overall I look forward to seeing the game in it’s final form. I expect great things from this one. You can check out the Kickstarter link below for even more information and to back the game. This entry was posted in Preview Reviews and tagged abel, board, board games, card, card games, cheeky, cheeky parrot games, flaming, flaming pyramids, games, norbert, norbert abel, parrot, pyramids. Bookmark the permalink.